Komali is a young social enterprise that offers an integral training and holistic approach to healing for people in healthcare (hospitals, homecare, clinics), Education (schools, colleges, universities) and business (self-help groups, corporations) in villages and cities. Its founders had developed and tested the concept in Canada and wanted to bring its fulfilling outcomes to the context of India. 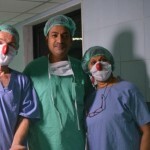 The idea of introduce “clown” in the medical healing process is very ancient (ancient art of clowning “Vedusta” in Sanskrit) its powerful effects are now subject of scientific research in modern times. 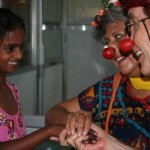 Komali is the Tamil word for clown. The purpose is to establish medical clowning as a viable profession within the therapeutic world, and to develop its multiples usages within the health care professions and within the populations in need of it. MeDi Clown Academy is meant to become a place of training, research and services: first it is spreading its approaches through lectures, theatrical events and training. 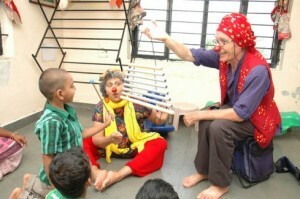 The present team is composed of 3 Auroville professional specialist in theater and clowning and a business manager, and some volunteers. Daily tasks: In collaboration with the team, design a research questionnaire. Collect, analyse and organize information and data about the emotional and physical results of our project in the Indian context. Be able to present the conclusions to others in a written report. Daily tasks: Assistance for the establishment of the social enterprise: marketing strategy, development and actions plans. Consolidate the initial work. Defining outreach media and modalities. Assist in the preparation of workshops, conferences and training sessions. Communication and Social Media. Update our data base and follow up of our contacts.